Protect and rehydrate severe dry eye with Systane Lubricant Gel Drops, designed to fight off uncomfortable dryness and irritation. 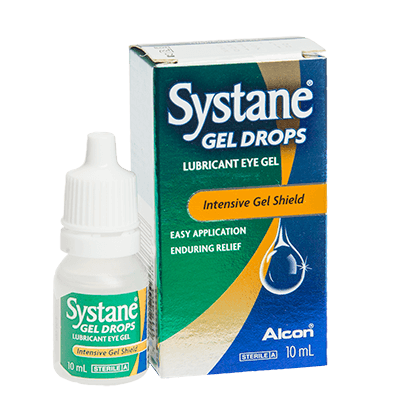 Developed by renowned eye care experts Alcon & Ciba Vision, Systane Lubricant Gel Drops work by creating a soothing cushion of moisture around your eyes, offering immediate and long-lasting relief to tired, gritty and dry eyes. This effective dry eye treatment is particularly ideal if you regularly suffer from dry eyes or spend long parts of the day using digital devices. Systane Lubricant Gel drops work best when applied right before bed, however are a convenient eye care option for anytime of the day. While they’re suitable for contact lens wearers, the eye drops should be used before you put your contacts in. Available in this 10ml bottle, you’ll be able to carry Systane Lubricant Gel Drops with you when you’re on the go, ready for when your eyes might need a quick refresh. For all our other Systane products, browse our extensive range at FeelGoodContacts.com. For any questions, please don’t hesitate to contact our dedicated customer service team for any assistance.